Reserve 8 whole wafers for garnish. Cut the remaining wafers into 2-inch-long pieces. Beat the egg yolks and granulated sugar in the top pan of a double boiler over hot water with a whisk for 5 minutes or until the mixture is thickened. Stir the coffee, wine and cheese in the pan. Cook and stir with a whisk for 10 minutes. Remove the pan from the double boiler. Let the mixture cool for 10 minutes. Beat the heavy cream, vanilla extract and confectioners’ sugar in a medium bowl with an electric mixer on high speed until stiff peaks form. Divide the espresso cream among 8 glasses. Top each with about 1/2 cup wafter pieces. Divide the whipped cream and the chocolate among the glasses. Garnish each with 1 whole wafer. 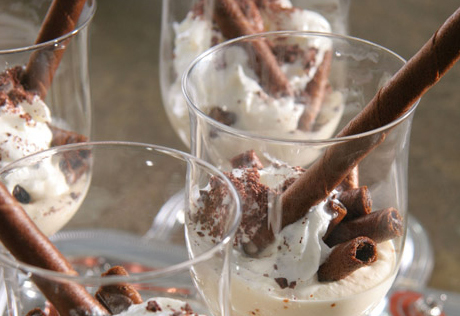 Tip: For a chic serving idea, serve this dessert in wine or martini glasses.